I’m not sure how I got started taking the ring shots that I do. I have always loved photographing jewelry. I really got started back in 2002, when a small boutique jewelry company in Tallahassee asked me to take pictures of their products. I bought my first macro lens and began learning the ins and outs of macro product photography. I was immediately hooked and started incorporating those macro skills into the images I took at weddings, first of just the bride and groom’s rings and then later of the engagement ring itself and all of the other small jewels of the day. I started trying to be more and more creative, thinking of ways to photograph environmental portraits of these details instead of just sitting them in decent light and clicking the shutter with little thought to creativity in the composition. 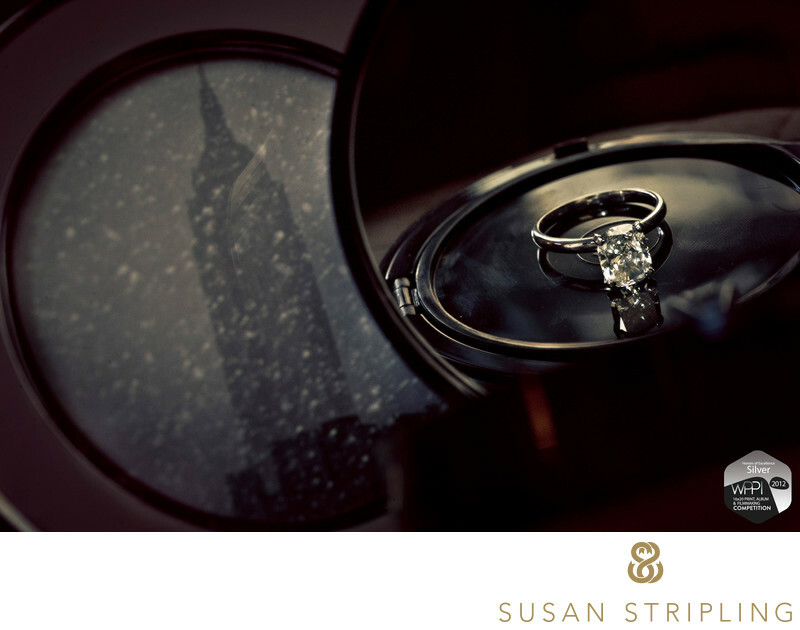 This was one of my favorite ring shots from 2011, and I entered it into the Wedding Division : Wedding Details category of the WPPI 16x20 International Print Competition. I love this image because it’s an excellent example of the storytelling that I try to achieve with something as simple as a shot of an engagement ring. The ring is sitting on the bride’s compact, reflected in the compact’s mirrored lid. The bride had this sentimental picture frame with the snowy building in the background and I used it as an element in the photograph to give it a sense of time, place, and personal importance. This image scored an 80 and I was pleased with the final score. 1/60; f/18.0; ISO 8000; 60.0 mm.